PALU, Indonesia (AP) — Home to hundreds of families, the Balaroa section of Indonesia’s Palu city was once a patchwork of asphalted streets and tidy houses dominated by a golden domed mosque. Now it looks as if it was picked up and thrown back to earth with vicious force. Four days after a powerful earthquake and tsunami hit Palu and other parts of Sulawesi island, killing more than 1,200 people, the devastated community of Balaroa has received no government help and anger is simmering among its residents. A handful of disaster personnel arrived in the neighborhood Tuesday morning to survey the damage. A lone backhoe began clearing a path into the jumble of twisted buildings. An official visiting from another part of Indonesia that has migrants in Balaroa said the neighborhood looked like it had been put in a blender. What were once streets looked like rolling hills. Cars sat meters (yards) above the ground, perched on eruptions of asphalt and concrete. Other vehicles stood upright, half buried. Photos, books, clothing and other belongings were strewn everywhere. Surreally, surrounding neighborhoods were largely intact. Residents said their shattered houses had moved by tens of meters. Some of them worked under a boiling sun with sledgehammers and shovels to break up rubble covering victims. In another corner of the neighborhood, a religious group said it had recovered 29 bodies in the past three days. Abdullah Sidik, limping with an injured leg, said he was heading for evening prayers when the magnitude 7.5 quake struck just after 6 p.m. Friday and rushed back home to find his wife and daughters. “I hope we can get aid from the government. Please pay attention to us. Palu is part of Indonesia. It feels like a dead city,” Sidik said. “I want to bury my wife and children. Please help me find them inside,” he said. Residents crowded around a team of Associated Press reporters, loudly voicing their complaints. Some had heard cries for help rising from beneath the rubble for two days. Now there is silence. There’d been nothing from the government, they said, no food, no water, no medical assistance, no search and rescue effort. Sa’Adon Lawira, cradling a kitten whose cries had led him to his dead grandchild, was angry that search and rescue efforts in the days since the quake have focused on places such as a hotel where tourists were staying. Because of its location on the “Pacific Ring of Fire,” Indonesia is prone to earthquakes, tsunamis and volcanic eruptions and is well versed in responding to disasters. 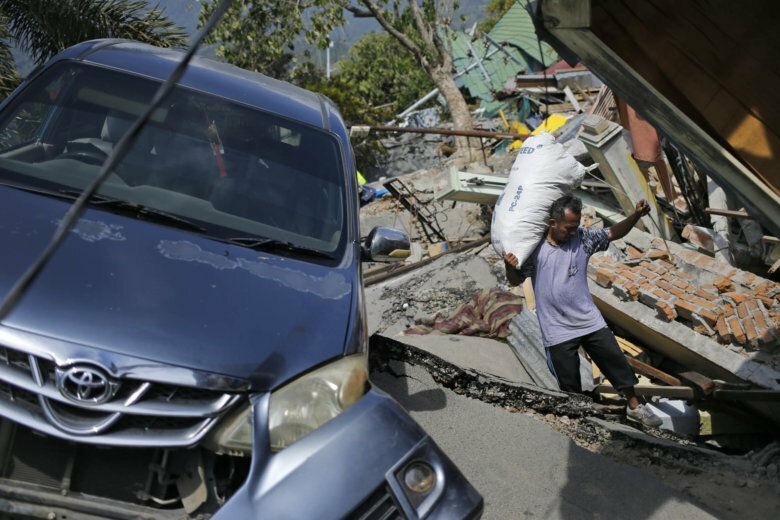 The Palu earthquake and tsunami has not been declared the same, but in a rare move, Indonesia’s government has appealed for international assistance, showing how hard-pressed it is to deal with the disaster. The area’s remoteness is one of the big challenges for the humanitarian effort. Disaster officials are uncertain how many people are buried in Balaroa. Residents gave varying figures — 50, 100, hundreds. Numerous children are believed to be buried in the neighborhood’s collapsed mosque because a Quran recitation group for children was being held there before evening prayers. Kawadi Razak, the chief of Sulawesi’s Sopeng district, who is connected to Balaroa because about 100 people from Sopeng had migrated there and some are among the missing, said the neighborhood was home to more than 2,000 people. Associated Press journalists Niniek Karmini, Fadlan Syam and Dita Alangkara contributed to this report.